Next Season is the last one for this Decade and I thought which Patriot might (or should) be considered for the 2010s All-Decade Team. The Pats have been - yet again - to at least 5 SuperBowls within the 10 year span and 2019 they still have a chance for another SB run. They won 3 and lost 2, there is nobody nowhere near as successfull as the Patritos in this decade - once again. There are a few Pats I would consider as no-brainers without even playing out 2019 season - which speaks volumes for itself and the dominance of those players within this decade! -, not choosing them to the First Team All-Decade Team would be very surprisingly. would consider Logan Mankins at least Second Team All Pro too but not sure if he will receive this honors. There are one or another player who has not played long for the Patriots but still could get some consideration here, thinking about Revis, Talib, etc. Whom may I have missed out here? Any other suggestions? 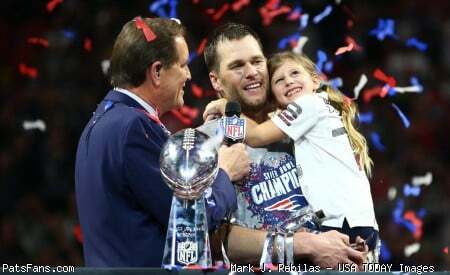 Tom was the first team QB for the 2000’s team and he’s going to be the first team QB for the 2010’s team as well. The best player in two different decades. The same thing is going to happen with Bill. Best coach for the 2000’s team, best coach for the 2010’s team. Puts into perspective how unbelievable this dynasty has been, and how good B&B have been for almost 20 years! Gostkowski is either first or second team with Tucker getting the other spot. I think Devin has an outside shot at second team. The interesting one is second team for QB because it should be Drew Brees but we know the media loves Rodgers. There is precedent for three with Bradshaw, Staubach and Stabler in the 70's. BTW with Julius Peppers retiring there are only 3 active participants from the 2000's all decade team. Bill, Tom and Adam. Indeed, Gost should get at least second team honors. I would consider him but NFL seems to under value this position, since 2016 they don't even consider it as an sepcific position anymore, only voting on Running Backs and "Flex" where again only RBs are considered. Though I like how BB and Develin have re-invented the position and lead the team to success by heavily using the FB as lead blocker again in the running game. I know he is not the stat monster like others, but he helped the Patriots with huge plays in the Super Bowl wins (and there were 3 of them in this decade). It might be still not enough for the voters and others might be considered better due to nice regular seasons stats. I would love to see McCourty sneak in on the second team. His leadership and intangibles would hopefully give him a tiebreaker, but I think he will just barely miss out as usual. He sacrifices a lot of ballhawking individual stats for the team, and in my opinion he definitely among the 4 best free safeties of the 2010s, if not top 2. Though Revis declined around 2015, I believe he should and will be first-team along with Sherman. Otherwise you are just rewarding CBs lucky to have started playing early in the decade whose years aligned with this criteria. Revis has three first-team all-pros during the 2010s and was the best CB at his peak, plus a ring. Unfortunately I don’t think Hightower has the individuals accolades to get on the team and there are some more deserving players, but he’s been amazing and clutch. I would put Tucker first team, Gostkowski second team. Obviously Brady and Gronkowski as first team. I wonder if Edelman has a shot to get on as a punt returner. What about the 100th anniversary all time team? Who gets bumped, Joe, Otto, Sammy or Johnny? No way 5 head deserves to be on there, that's for sure. How about NFL all decade team vs the Patriots all decade team? Would have been a great game. Talib: 26 interceptions, 10 defensive TDs, 99 passes defended. There's a lot of others with better numbers, some surprising like Brent Grimes but the point is having been out of the league a few years I think he's a coin flip to get the second team and won't get the first. Interestingly if Gilmore has another All Pro Team year next year he could slide in. Having better numbers at CB does not mean you are a better CB. Revis clearly deserves first team and will likely get it. Everyone knows he was the best cornerback of the 2010s, and the voters will realize his cumulative stats don’t need to stack up as long as he is somewhere in the same stratosphere. I think Manning Inc. (a subsidiary of Budweiser) gets the Forehead on this list by either adding a fifth QB slot (subtract Baugh, add Brady and Manning) or by replacing Baugh and Graham with Brady and Manning. Yes, it would be criminal to replace Otto Graham, who is clearly a top 4 all-time QB with a choke artist like Manning, but never underestimate the media's desire to put this loser on Mount Rushmore. The top 4 are so obvious to me at the QB position, in alphabetical order: Brady, Graham, Montana, Unitas. Anyone with a knowledge of football history would see QB as the easiest position to pick. The guys who are barely on the outside are Starr and Baugh, and I can see why those guys are just about as deserving, especially Starr. I don't see a much greater argument for Manning than Elway, Brees, or possibly Marino. Outside of his clearly undeserved MVP awards. I'd add AJ Green - especially considering where he's been all this time. 10 TD's for Talib?! I hadn't been tracking that. Impressive.